Thonny is an integrated development environment (IDE) for Python designed for complete beginners. It comes with Python 3.6 built in, so just one simple installer is needed and you're ready to start programming your Edbot. The video below gives a good introduction. Download and install Thonny. Click on the Tools menu and select "Manage packages". In the search box type "edbot" and click the search button. Now click the install button to add the package. My version of Thonny (2.1.16) gave an irritating error traceback window. I just pressed OK and it didn't seem to matter. I'm assuming this is a bug they'll iron out in a future release. Make sure the Edbot Software is running on your computer and your Edbot is switched on. Open the "Server Setup" window and configure your Edbot if you haven't already done so. Before applying, go to the settings pane and select "Bypass Active User". This removes the need to keep selecting the active user from the Edbot drop-down list every time you run your Python code. Now it's time to code. Go to Thonny and select "New" from the "File" menu. Type the following and press the green run icon. The first time around you'll be prompted for a file name. Give your project a name and save it. Don't call your project edbot - this may confuse Thonny when it is trying to find the edbot package. 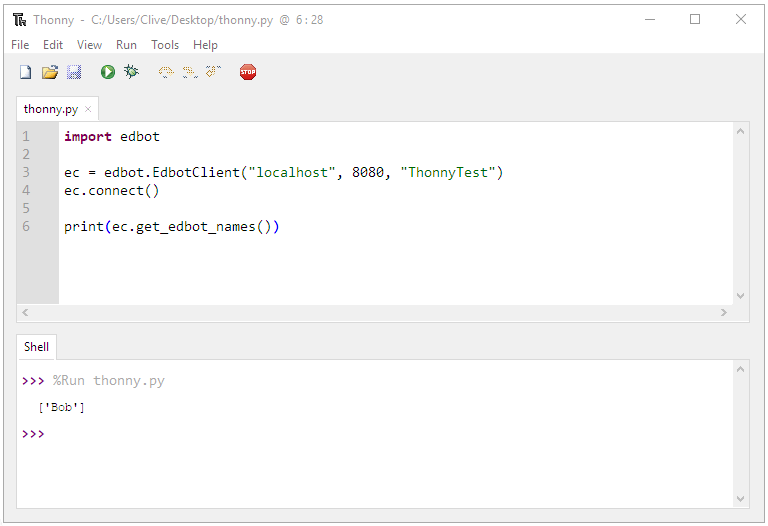 This simple Python program returns the names of the Edbots configured on your Edbot server. You can now have fun and explore the full Edbot API using the online Edbot Python documentation.